Yealink announced today that its video device solution for Zoom Rooms will include both the Yealink CP960-UVC50 Kit for Zoom Rooms, for small-to-medium rooms, and the Yealink CP960-UVC80 Kit for Zoom Rooms for medium-to-large rooms. The Yealink Kit for Zoom Rooms is a complete Zoom Rooms package that includes hardware (computer, camera and audio devices), software and licensing. With Yealink total bundle solutions, users will have a complete device package from a single vendor, simplifying the purchasing process and bringing convenience to the after-sales service experience. The Yealink CP960 conference phone unites a microphone, speaker and Zoom Rooms controller. 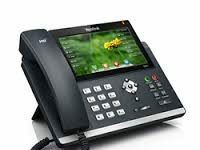 It comes pre-loaded with a Yealink CP960 license for Zoom Rooms so that users can manage meetings via the familiar Zoom Rooms controller interface. It also features Yealink Noise Proof technology. What’s more, the Yealink UVC series has an optical PTZ camera and a wide-angle lens for vivid face-to-face video conferencing. The Yealink UVC50 optical PTZ camera is optimized for small-to-medium rooms while the UVC80 optical PTZ camera is optimized for medium-to-large rooms. This solution will provide users with ease of management and simple deployment. With the Yealink CP960 as the meeting console, multiple management tools on the touchscreen display enable users to join the meeting, mute audio and control the the camera. In addition, the CP960 will feature Yealink’s one-cable technology solution, eliminating the need for a USB cable to cross from the television area to the conference table area. A single cable for both speakerphone audio and control will make deployment much easier. Yealink will be showcasing its video device solution for Zoom Rooms this week at Enterprise Connect.